The LattePanda board Enclosure is completely made from aluminum CNC material, and not from sheet metal, what you normally find with most low-cost enclosure sold on the market. That means that the body is made of a raw material, making it super strong and very durable. its composed of two separate parts, the base which is the lower part where the board is mounted and straighten against four PCB nuts assembled inside the upper cover, and connected with four hexagonal socket head cap screws. For the power and reset buttons company included a pair of a metal-made bushing, that is also CNC manufactured. Having said that, both design and quality were impressive and superb on all levels. Intel CPUs do not know as very power efficient. 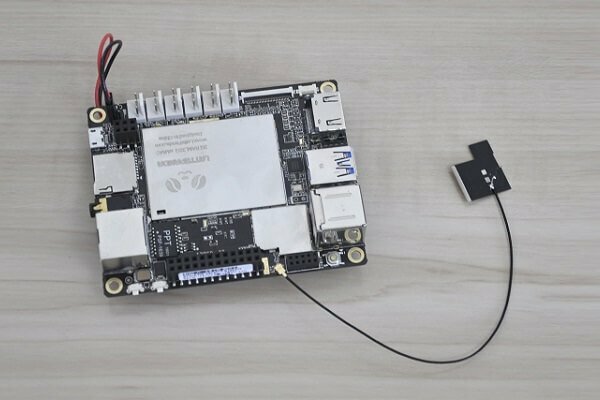 The LattePanda board is powered by an Intel’s Atom x5-Z8300 a quad-core processor, which operates in CPU temperatures between 63 – 75C. Tested in an Idle mode with ‘Open Hardware Monitor’ software, and without overloading system resources. The process of assembly is very straightforward. First, you will need to mount the heatsink fan in the back if the board passive cooler, where the CPU is located using the 3M thermal pad sticker. Second step. connect the external WiFi antenna wire to the socket on the board. Insert the two bushings for the power and reset buttons. Place the LattePanda board inside the lower part of the case and close it against the upper part, and finally, connect both parts of the case with the provided Allen wrench and four hexagonal socket head cap type screws. An excellent kit for cooling the LattePanda board. The fan performed wall with a very quiet operation. What I was missing as a user, was a hole for adding a flexible external RPSMA WiFi Antenna, but overall the product is of high quality and worth the money. Having said that, for a full review of the LattePanda you are welcome to check it Here.